Get access to an image. Create a variable for the pattern. Like gradients, pattern fills can be reused, so store the pattern in a variable for later reuse. 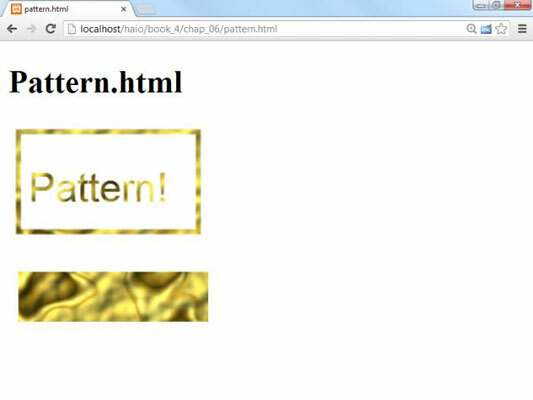 The context’s createpattern() method creates a pattern from an image. Specify the pattern’s repeat parameter. The second parameter indicates how the pattern will repeat. The default value is repeat, which repeats the pattern in both the X and Y axis indefinitely. If your pattern is not tiled, you will see a visible seam where the pattern repeats. You can also set the repeat value to repeat-x, repeat-y, and no-repeat. Apply the pattern variable to the fillStyle or strokeStyle. Assign the pattern variable to the context’s and then perform any fill operation to draw in the pattern.